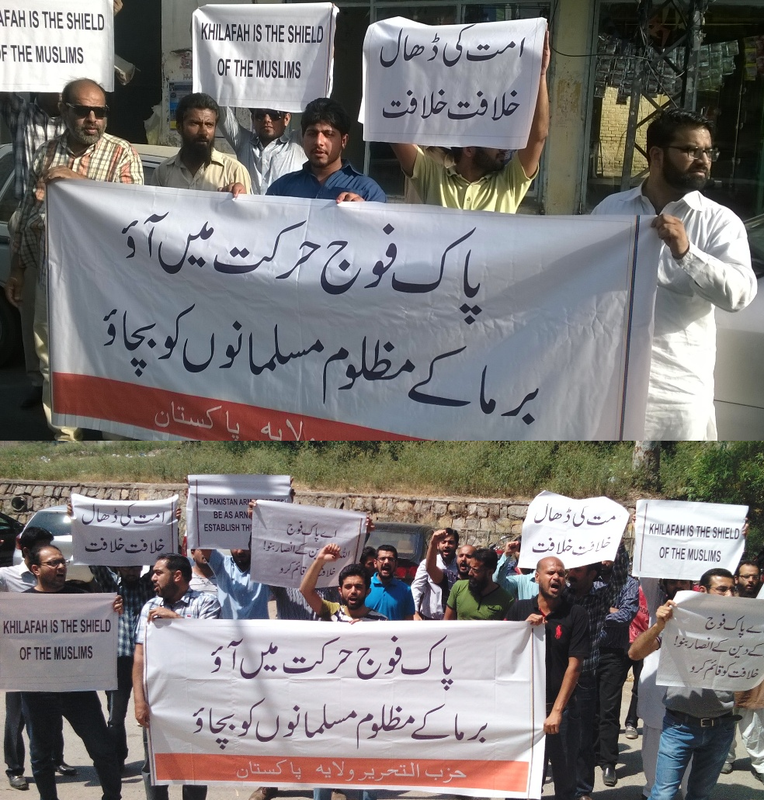 Hizb ut-Ttahrir i Wilayah of Pakistan held demonstrations across Pakistan in support of the Rohingya Muslims. Participants held banners and placards declaring, “O Pakistan Armed Forces! Mobilize for the Protection of the Rohingya Muslims” and “Khilafah is the Shield of the Muslims”. Like other rulers of Muslims, the Raheel-Nawaz regime has abandoned the Rohingya Muslims to persecution by the Kafir Buddhist rulers of Myanmar. The height of insulting the powerful ties of our Deen, was that whilst thousands of Rohingya Muslims were fleeing their country to escape severe oppression, the Raheel-Nawaz regime welcomed General Khin Aung Myint, Commander-in-Chief of the Myanmar Air Force, to increase cooperation in various fields including defense. No current ruler of Muslims has come to help the Rohingya Muslims as they deserve. Worse, Bangladesh, Indonesia, and Malaysia declared that pushing them back to the Pharaohs of Myanmar is in their national interest! The current rulers of Muslims do not respond to the cries of Muslims. They only mobilize our armed forces when the West orders such mobilization. Witnessing their corrupt stance, the entire Ummah knows now that these rulers are not from them. They care not for the pain of the Rohingya Muslims. Not only Muslims, even non-Muslims who care for human suffering, are protesting against the persecution of the Rohingya Muslims. Yet, the rulers of Muslims are behaving as stone-faced corpses who neither see, nor hear, nor feel nor move. "اگر وہ دین کے بارے میں تم سے مدد چاہیں تو تم پر ان کی مدد لازم ہے"